Standing at 245 feet tall, Titan is the tallest roller coaster in the state of Texas. The actual first drop is 255 feet with the addition of a 10-foot underground tunnel. The layout of the ride is so large that it spans out over the park's employee entrance and near the overflow parking lot. In the summer, Titan can reach speeds of over 90 MPH. These speeds are enough to melt the wheels on the train. However, Six Flags has installed a misting system to ensure that the wheels always stay cool enough for safe operation. 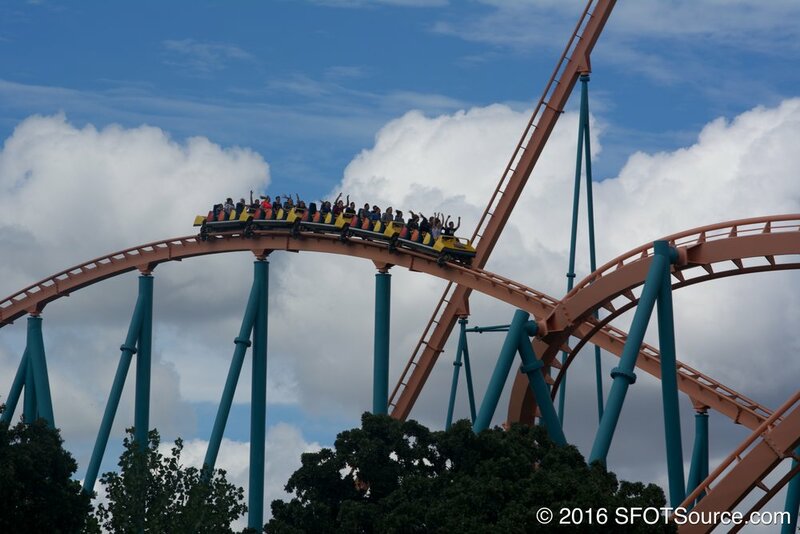 The ride came in at a total cost of $25 million and was added to the park as part of Six Flags Over Texas' 40th anniversary season. Goliath, located at Six Flags Magic Mountain in California, is actually quite similar to Titan at Six Flags Over Texas. Both coasters look nearly identically the same all the way down to the track colors. The differences are in the fine details. Titan actually stands 10 feet taller than Goliath (though Goliath's deeper tunnel gives the ride the same 255-foot drop). Titan's path into the mid-course brake run is also a helix while Goliath simply banks to the left to enter its brake run. Ever see Six Flags commercials throughout the park and on television and think you are seeing Titan? It is likely that the footage is of Goliath. Seatbelts are added to Titan’s restraint system.